Victor B. Sáenz received his Doctor of Philosophy (2005) and a master’s degree (2002) from the University of California, Los Angeles in Higher Education & Organizational Change. 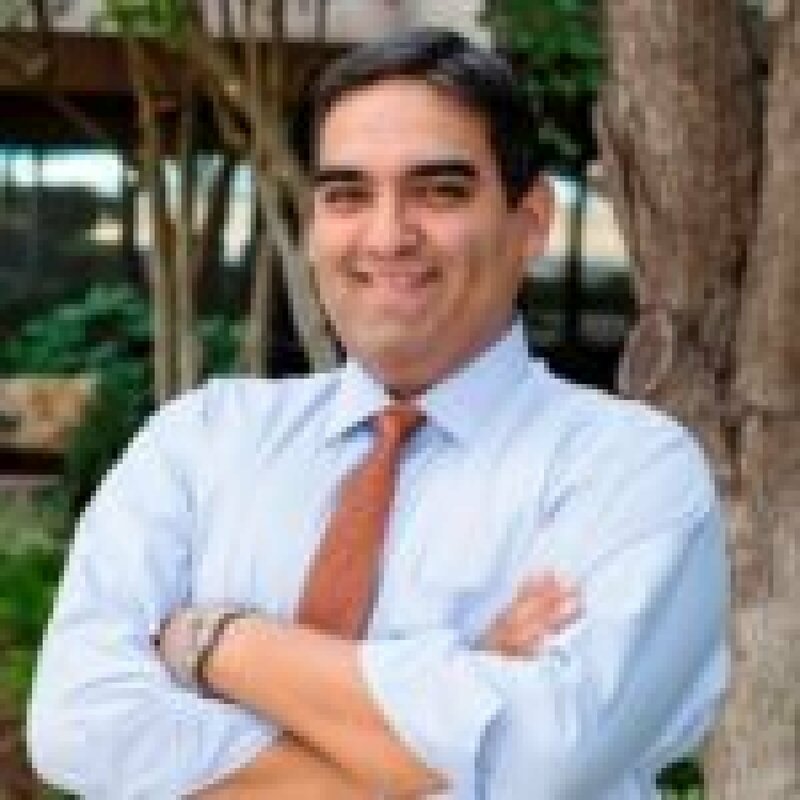 He also holds a master’s degree (1999) from the LBJ School of Public Affairs and a bachelor’s degree in Mathematics (1996) from the University of Texas at Austin. Sáenz is Chair of the Department of Educational Administration at the University of Texas at Austin, and he is a Fellow in the A.M. Aikin Regents Chair in Junior & Community College Education Leadership. He also holds courtesy appointments with the UT Center for Mexican American Studies and the Department of Mexican American Studies. Since 2008 he has also been a Faculty Fellow with the UT Division of Diversity and Community Engagement (DDCE). In 2010, Sáenz founded an award-winning initiative called Project MALES (Mentoring to Achieve Latino Educational Success), a multi-pronged effort based at UT-Austin that is focused on advancing success strategies for male students of color across the education pipeline. In 2013, the project launched a statewide initiative called the Texas Education Consortium for Male Students of Color. Supported by grants from the Greater Texas Foundation (GTF), TG, and the Kresge Foundation, this statewide collaborative focuses on improving educational outcomes for male students of color across the state of Texas. The Consortium is made up of over twenty institutional partners in K-12 and higher education, and it seeks to align and coordinate existing programs and services that target underrepresented male students across the education continuum. The Consortium is a coordinated response to the growing statewide educational imperative focused on male students of color. Sáenz has published in numerous peer-reviewed journals and recently published two books, including one on Latino males in higher education (Stylus Publishing, 2016). His current research agenda seeks to advance research-informed best practices and policy solutions that improve educational outcomes for underserved students in postsecondary education, with a special emphasis on young men of color. Sáenz has received several notable accolades in his academic career. In 2009, he was named by Diverse Magazine as “One of 25 to Watch” diversity leaders in American higher education. In fall 2010, he was recognized as one of seven “ING Professors of Excellence” among over two thousand faculty members at the University of Texas. Over the years, he has been quoted and cited in numerous news stories, policy reports, and scholarly publications, and his research work on Latino males in higher education continues to gain national attention. He is a member of two distinguished editorial boards for peer-reviewed journals in his field, and he is an active member of several national associations focused on higher education issues, including ASHE, AERA, AIR, AAHHE, and TACHE. He has spoken about his research and programmatic work on Capitol Hill and at conferences across the country. He is also on the national boards of the Association for the Study of Higher Education, the American Association of Hispanics in Higher Education, and the National Resource Center for the First Year Experience, the Hispanic Scholarship Consortium, and Catch the Next. Ensuring the Success of Latino Males in Higher Education: A National Imperative. Eds. Victor B. Sáenz, Luis Ponjuán, and Julie L. Figueroa. Stylus Publishing, LLC, 2016. “Examining Culturally Responsive College Readiness in the Rio Grande Valley of South Texas.” With Taryn Gallego Ozuna, et. al. Journal of School Leadership 26.1 (2016). “Increasing Latina/o Student Success.” With Taryn Gallego Ozuna, et al. JSL 26.1 (2016): 154. “Latino Males in Higher Education.” With Sarah Rodriguez, et. al. Ensuring the Success of Latino Males in Higher Education: A National Imperative (2016): 26. “The Texas Education Consortium for Male Students of Color.” With Luis Ponjuan. (2016). “Developing a Latino Mentoring Program: Project MALES (Mentoring to Achieve Latino Educational Success).” With Luis Ponjuan, et. al. New Directions for Higher Education 2015.171 (2015): 75-85. “Coming home: Hermanos académicos reflect on past and present realities as professors at their alma mater.” With Richard Reddick. Harvard Educational Review 82.3 (2012): 353-380. “Men of Color: Ensuring the Academic Success of Latino Males in Higher Education.” With Luis Ponjuan. Institute for Higher Education Policy (2011). “Breaking the segregation cycle: Examining students’ precollege racial environments and college diversity experiences.” The Review of Higher Education 34.1 (2010): 1-37. “Moving beyond high school expectations: Examining stakeholders’ responsibility for increasing Latina/o students’ college readiness.” With Erica K. Yamamura and Melissa A. Martinez. The High School Journal 93.3 (2010): 126-148. “Policy Transparency and College Enrollment: Did the Texas Top Ten Percent Law Broaden Access to the Public Flagships?.” With Mark C. Long and Marta Tienda. The ANNALS of the American Academy of Political and Social Science 627.1 (2010): 82-105. “Examining the precollege attributes and values of Latina/o bachelor’s degree attainers.” With Oscar Cerna and Patricia P. Perez. Journal of Hispanic Higher Education (2009). Advancing in higher education: A portrait of Latina/o college freshmen at four-year institutions, 1975-2006.With Sylvia Hurtado, et. al. Higher Education Research Inst, 2008. “The vanishing Latino male in higher education.” With Luis Ponjuan. Journal of Hispanic Higher Education (2008). “The American Freshman: Forty Year trends.” With John H. Pryor et. al. Los Angeles: Higher Education Research Institute 3 (2007). “Factors influencing positive interactions across race for African American, Asian American, Latino, and White college students.” With Hoi Ning Ngai and Sylvia Hurtado. Research in Higher Education 48.1 (2007): 1-38. First in my family: A profile of first-generation college students at four-year institutions since 1971. Higher Education Research Institute, 2007. “Predicting transition and adjustment to college: Biomedical and behavioral science aspirants’ and minority students’ first year of college.” With Sylvia Hurtado, et. al. Research in Higher Education 48.7 (2007): 841-887. “What we can learn from UCLA’s” First in My Family” data.” With Doug Barrera. Retention in Higher Education 21.9 (2007): 1-3. “The educational benefits of sustaining cross-racial interaction among undergraduates.” With Mitchel Chang, et. al. The Journal of Higher Education 77.3 (2006): 430-455. “Understanding the effects of service-learning: A study of students and faculty.” With Alexander W. Astin, et. al. Report to the Atlantic Philanthropies (2006): 1-155. “Can service learning and a college climate of service lead to increased political engagement after college?.” With Nida Denson and L. Vogelsang. Higher Education Research Institute. UCLA. (2005).